I saw an article about this phenomemon in September in Ladies' Home Journal and, more recently, The Washington Post did a piece about a lady who had an invasion in her dog kennel. At least 40,000 were sitting on the windowsill (hard to believe, but pix don't lie) and she called in an exterminator to remove the bugs. Here's something even more headshaking. Apparently they emit a musky odor and leave yellowish stains called reflex bleeding when they die. AND they sting! I just can't believe it. My little ladybugs? Well, no. Acording to the latest article these bugs are the Asian lady beetle and have invaded the Eastern US over the last 13 years. Indian summer activated them and the local pest control companies deactivated them. With the arrival of much cooler weather hopefully all swarming is finished for the year. But be on the look out and use the best prevention methods - seal cracks around windows and doors. 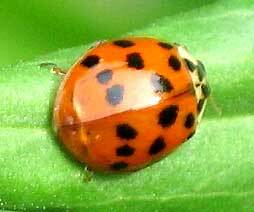 Happy Gardening and remember, next time you see red spots before your eyes it just might be the Asian lady beetle. The idea of exterminating ladybugs just seems really wrong to me. But then I don't kill bugs at all. Well, maybe cockroaches. One of my clients had a bee hive on their roof and called in an exterminator. I was appalled. Call in a bee keeper and have it removed. Hello! People are still too chemical oriented. I'm not sure what kind they are, but we used to get an invasion every winter when we lived in CT. Hundreds and hundreds. My husband would vacuum them up and release them outside, but the dust they'd emit made him ill. There are general differences in physical characteristics between lady bugs and asian lady beetles, as well. The lady beetles tend to be more orange than red, and their spots look slightly different. I should know we're literally swarmed by them yearly - and no it's not cold enough for it to be over this year yet. Their numbers are nominal at this point but they're still around and impossible to get rid of. The smell isn't just unpleasant it's downright disgusting and it doesn't go away, if you vacuum them up, which is about the only thing you can do when there are thousands (and that is not an exaggeration) in one spot the smell stays in your vacuum cleaner and then everytime you turn it on you get to smell it all over again.